As the search for the two escaped inmates in New York expands, another manhunt is underway in Maine: the search for suspected murderer Robert Burton. Like the New York inmates, Burton has been on the run for 13 days, and is believed to be in a wooded area. Maine State Police have issued a warrant for Burton's arrest, in connection with the death of his ex-girlfriend, Stephanie Gebo. She was found dead in their home in Parkman, which is the rural Piscataquis County, about 60 miles northwest of Bangor. 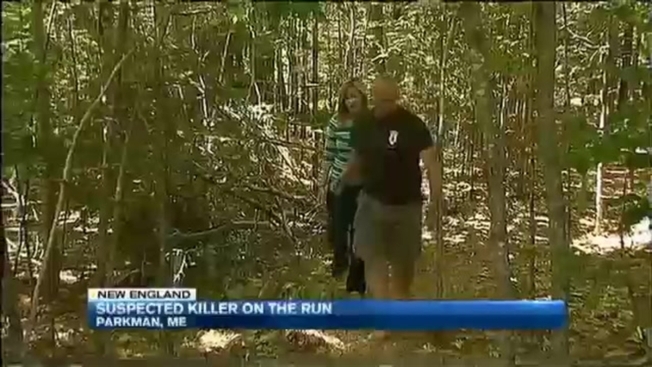 "It's the area he's from, it's the area he's familiar with and comfortable with, and that's why we continue to search here," said Maine State Police Detective Darren Crane. Maine State Police have brought in law enforcement from New Hampshire and Massachusetts to aid in the search. Without technology, or support from someone else, outdoor survival experts say it's difficult to stay hidden in the woods for more than two weeks. "The woods is the great equalizer," said Michael Douglas, the founder of the Maine Primitive Skills School in Augusta. "If you don't have the skill sets, it's going to humble you and spit you out." Douglas said it's possible to travel 20 miles a day on foot for the first four days in the woods, but after that, hunger and the threat of hypothermia start to set in. "If they're in the woods for three weeks, without training, it might be time to call it a recovery instead of a search," said Douglas. Police are asking anyone in the Parkman or Monson area to keep their eyes out for anything out of the ordinary. They warn that Burton is armed and dangerous. He is described as being 5'11 tall and 180 pounds, with brown hair and blue eyes.